This intimate workshop will offer participants a chance to create handmade, giftable sachets for their loved ones during the holiday season, and teach skills for endless applications in the future. I’ll be hosting this in collaboration with Grace Aberdean Habitat Alchemy in Tuscaloosa, AL, which is another great place to support during the Holidays! 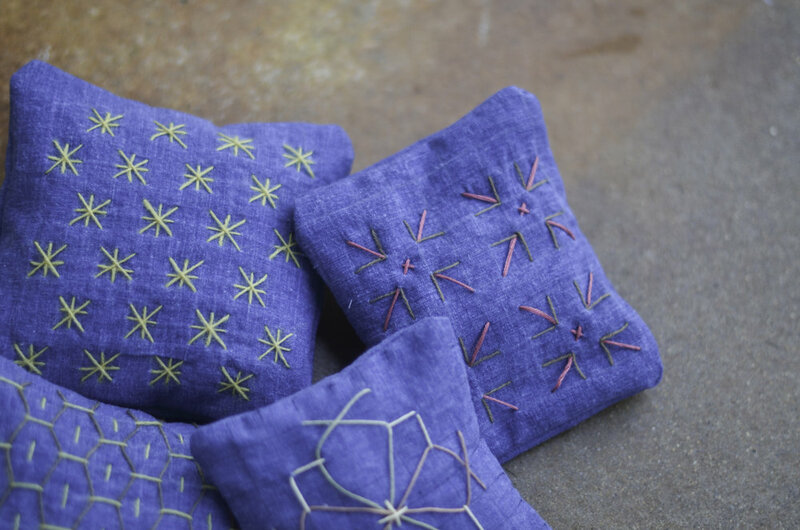 Participants will learn the basics of hand-stitching and Sashiko as we create four hand-stitched squares using naturally dyed thread from Fiber Farm and my own Indigo-dyed linen. We’ll then assemble one of these squares into a fully finished sachet. Each participant will then choose from an assortment of locally sourced dried herbs, along with some essential oils, to create a customized scent to fill their sachet with. Students will learn simple construction techniques using hand-stitching, and learn to construct a french seam by hand. Participants will leave with one finished sachet, but all of the materials, filling and knowledge to create four total sachets, leaving you with plenty of gifting opportunities (or just keep them for yourself). The sachets can be put in your car, on your nightstand, or anywhere that might need a little refreshing. We’ll enjoy holiday drinks and snacks. Registration is required, and space is limited.